Vydar’s undead have gotten weirder. These Arctoran candidates phase through unsuspecting figures. Can these phantoms walk into Valhalla? There’s a few squads worth comparing the Specters to. A good one to start off is the Marro Gnids. The Gnids have an extra move, and the Specters have an extra defense. Both have the ability to lower an opponent’s defense, but the Gnids’ is narrower in scope (unique heroes), and permanent. The Specters’ is only for a single turn, takes a little extra setup, but it automatically works on anybody, unique or common, hero or squad. The Specters also have Levitate, which is sometimes pretty good, and other times completely worthless, and they have Phantom Walk, which facilitates their Deathly Touch and gives them lots of flexibility. A pretty good comparison, if slightly in favor of the Specters. Again, the theme is really strong here. Not 100% sold on Harbingers, but I think it works in general. They’re spooky undead that signals that doom is coming on those they visit. Phantom Walk and Deathly Touch work very well together as a theme package. Getting a bonus through moving through somebody? Cool! Especially since it leverages a classic Heroscape power (Phantom Walk) to make it concretely useful in every game the Specters will play. I tried several ways of adding Specters to an army. They have no real synergies, so they’re very open-ended in that regard. Given start zone restrictions and their low point cost, the Specters of Aldorn hard to make the core of a full 500-point army. It’s similar to the struggle of fitting a bunch of squads of Romans into your army, except without a bunch of bonding heroes to use up the rest of your points synergistically. The second way I tried using the Specters was as a screen. They’re fast, and cheap, and have decent defense, so I thought it was worth a shot. Turns out, that’s not the best use for them. Even with the ability to Phantom Walk through an opponent’s screen, Specters don’t have enough defense to withstand concentrated attacks, and don’t have any way of filling their front lines as they’re attacked (like Rats or Cutters). In the end, I found the Specters of Aldorn most effective as a first strike force, with 2-3 squads backed by Raelin. 180 points/9 spaces fits in many hero-heavy armies, and is a good way to address some weaknesses of those hero-heavy armies (board control, mostly). In this usage, the Specters ended up being surprisingly powerful. The defense reduction makes their attack nearly as effective as 3 attack, or 4 with height. And when you notice that the defense reduction works even when another Specter does the attacking (which is thematic), the Specters are very, very flexible in choosing their attacks. This is especially true on maps with road, which tend to funnel opponent’s figures into nice little lines for the Specters to zip through with 9 move (because Levitation is optional). Levitation provides the Specters with Snow and Ice Enhanced Movement, Lava Resistance, Slither, and Glide all rolled into one. This is especially helpful on lava maps, where lava field is often placed onto height. That third attack die is very helpful to the Specters, even though they don’t exactly need the help. The Specters’ only real weakness is figures with 5 or more base defense. 2 attack against 4 defense just isn’t great odds. But if you’re just using your Specters as a first strike force, you can easily add a menacer or two to your army. I was a big fan of the Specters, and had a whole lot of fun zipping them across the battlefield. But on many common map types (road and lava), and against most enemies (4 defense or less), the Specters just come off a bit too strong. I vote to induct the Specters of Aldorn into the SoV, but I’d love to see them back with a simple cost adjustment if they do end up failing. If there's another down vote, which I expect to be the case when the first review is a down vote, I'll probably pull the design and resubmit. How much of a cost adjustment do you think would be necessary? Before submission I was back and forth between 50 - 60 points, so my gut says I should bump it up to 60, since I was considering submitting at that point to begin with. "Harbingers" seems to be really unpopular, so for a resubmission I will be changing the class to something else. "Stalkers" or "Vagrants" are the two classes I'm leaning towards the most right now. Vagrants are like homeless people. That would not be a good choice. "Stalkers" would be fine, for apparitions. There are lots of choices. Over pricing concerns, I'd suggest you let the reviews run their course. Different judges might disagree with me. If you just change the price, any judges who have already reviewed a unit can just reissue their review (with a vote flip) in most cases. That's what I'll do if you end up resubmitting at 60 points down the line. You won't be speeding up the process by removing and resubmitting. It looks like the books of Tetraites and Bol haven't been linked to the main list of approved units on the first page of this thread just yet. After some time, doing a few reworks...I'm back with the Shadow Faction. 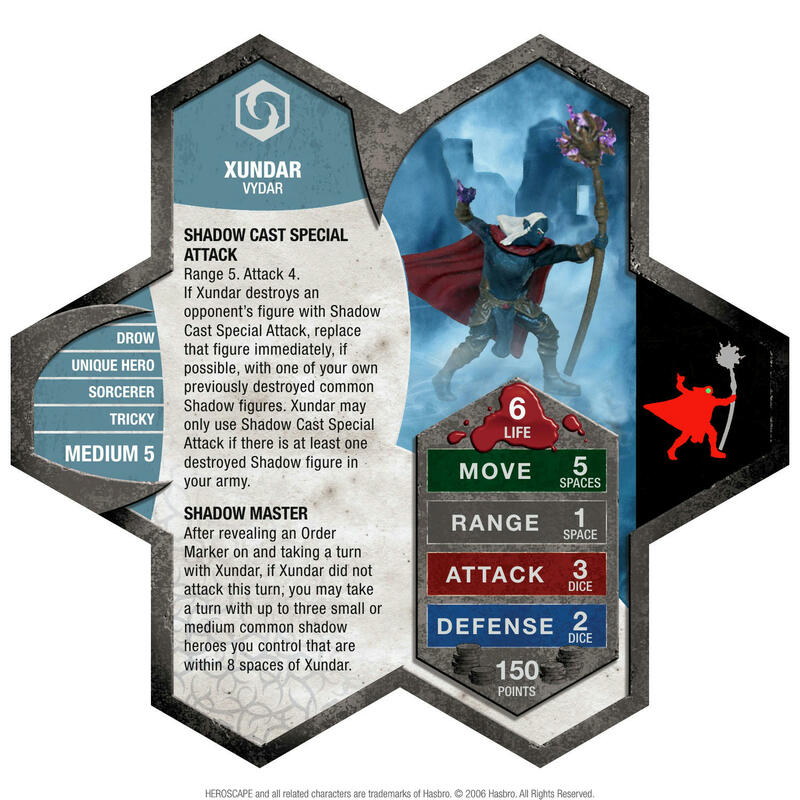 At their head is Xundar (primary submission) and his conjured shadows (3 common heroes, all secondary submissions). Bio:Taelord called out to halt the line of troops, something wasn't right. Marching on Vydar's forces in the middle of the night was supposed to be a tactical advantage, but the air was too still and his senses seemed dampened by the dark. "March on!" he barked, "but keep it quiet, there's something out there." As they took a bend in the road, pitch blackness awaited them; pooling and spinning in multiple forms. An eerie smile, lit only by the soft glow of a sorcerer staff, hung in the middle of the blackness as if suspended on it's own. "Welcome," it said "to my domain." Xundar: He's the army, plain and simple. Without Xundar, this faction falls flat. He's like unto other commanders that when they fall the army is less productive, but even without a commander the Ashigaru can fight well enough and the FE's without Kurrok are kind of a little army unto themselves and Elves without Ulginesh can do okay as long as they're near other elves. True to theme, the conjured Shadows fall away when their master has fallen. Hence I've made him fairly strong in his ability to move and command shadows in the same turn, but kept him balanced in high pricing, low defense, and a shorter range for his special to keep him from kiting the end game to effectively. 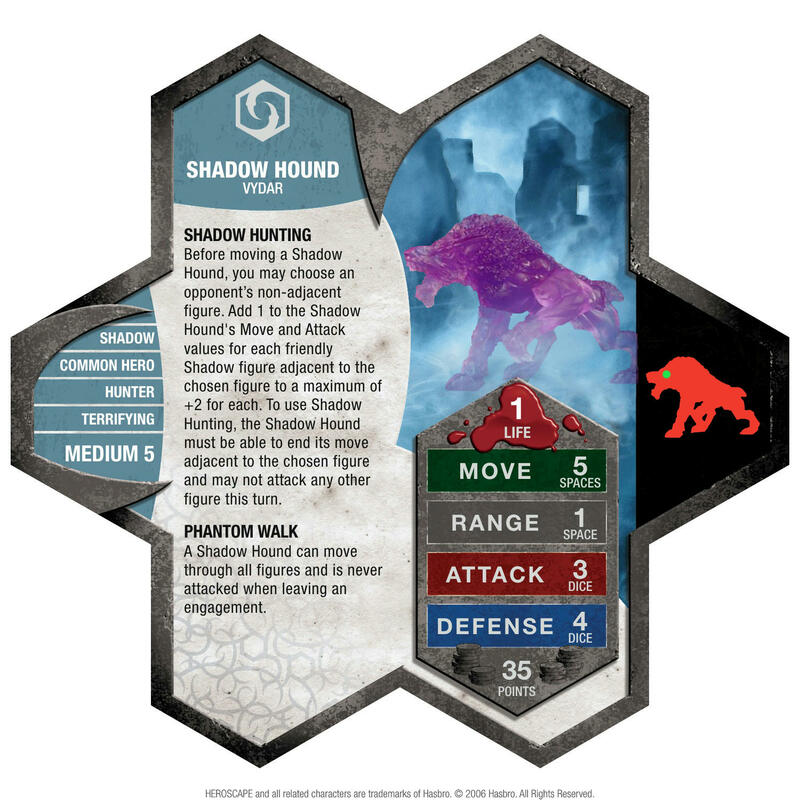 Shadow Hound: Tank of the army. Holds the line, but without other Shadows around really struggles to produce, also because his power only activates on figures he was not engaged to at the start of his turn. Shadow Fiend: High movement allows this unit to be the shock troop of the army, swooping in to deal the final blow once the opponents units are confused and preoccupied. The Fiend is a form that gets stronger with its comrades around; its movement and attacks more powerful with their support. Shadow Binder: These guys strictly act as the map controllers for this army. Their offensive output if very weak (maybe killed like 4-5 figures in the 20 tests I've done), but they provide a tactical advantage for this army that helps them to set up their powers as well as take an opponent out of position. Playability Each unit has their own unique ability as well as one common thematic ability. All of their abilities tie them together, to their minis and to the theme. The abilities read easily, are understandable and operate as expected. Creativity These units have easily been the most creative I've worked on. Something is just exciting about a conjuring Drow Sorcerer on one end of the battlefield sending his shadow minions out to take an enemy head on. Each unit is created unique and all play AND look good together. They all just FIT. Theme Theme drips from the minis, the design and the way they play. Heck, look closely at the mini and you'll notice that Xundar's staff even has the SAME EXACT translucent purple at the top as the shadow minis themselves...just perfect. But yes, the cards powers all have theme roped into them tightly. Accessibility Xundar's miniature is widely available for ~3-$4 with over 80 figures currently in market. All the Reaper Shadow minis are also widely available and currently in production directly from the manufacturer (Reaper Minis). You can purchase them off of their website for about $3-$4 a piece. - You typically want even numbers of Hounds and Fiends though if you have an uneven number of them, take the extra Hound. Hounds are great for pushing the frontline and holding the map, while Fiends are great for flying in as shock troops from the Startzone and killing something that's been bogged down. - Keep Xundar safe! That should go without saying, but 6 life and the ability to move can make you a little cocky...because once he's caught, he goes down quick. More so than any other commander out there, he's the weakest defensively AND his army hurts the most once he's gone. I'm not sure I like either of the special attacks getting 4 dice, but I'd like to see for myself. to review Xundar and all the Shadows. I'm happy with the changes to the faction. I still have some reservations, but they are things playtesting can hash out. Similar boat as sf and Scy. Definitely have things I'll want to check with the Special Attacks and Binder potential, but they're things I'm willing to test for. to review the Shadow Faction. Xundar, the Shadow Binder, the Shadow Fiend, and the Shadow Hound all have received 4 Yea votes to review (superfrog, Scytale, BiggaBullfrog, and Tai-Pan) and move forward in the process.